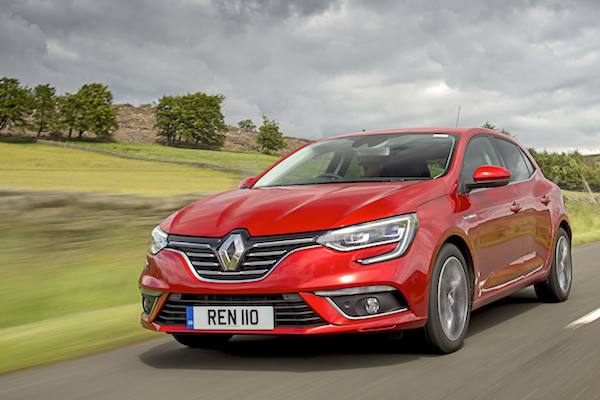 Renault Megane sales are up 120% year-on-year in Austria in November. New car sales in Austria are up by a robust 12.5% year-on-year in November to 29.547 units, lifting the year-to-date volume up 7.8% to 327.669 deliveries. The Top 4 best-selling brands all beat the market: Volkswagen is up 18% to 17.3% share, Skoda surges 53% to 7.3%, Renault is up 27% to 6.3% and Ford up 23% to 6.1%. In the Top 10, Hyundai (+30%), Seat (+19%) and Audi (+15%) also shine while beyond, Subaru (+113%). Peugeot (+63%), Jeep (+40%), Tesla (+40%), Toyota (+39%) and Mitsubishi (+21%) make themselves noticed. Model-wise, the Top 6 best-sellers outpace the market, led by the VW Golf (+67%), Tiguan (+30%) and Skoda Octavia (+33%) and followed by the Skoda Fabia (+52%), Audi A4 (+27%) and Renault Megane (+120%). The Renault Captur (+68%), VW Touran (+90%), Seat Alhambra (+75%), Ford Focus (+73%), Hyundai i30 (+143%), Ford Kuga (+129%) and Peugeot 5008 (+967%, outselling the 3008 almost 3-to-1) also shine. The Opel Crossland X (#38) leads newcomers ahead of the Skoda Kodiaq (#57), Karoq (63), Jeep Compass (#66), Suzuki Ignis (#74) and Hyundai Kona (#88). Produced locally, the Jaguar E-Pace makes its very first appearance in any sales charts of any country in the world with one lonely unit sold this month. Full November 2017 Top 40 All-brands and Top 290 All-models below.